The name “Hold My Crown” pays homage to the work of Lithuanian brewer Aldona Udriene, known as “the queen of Lithuanian farmhouse beer,” while also conveying a message of strength, fearlessness and empowerment. 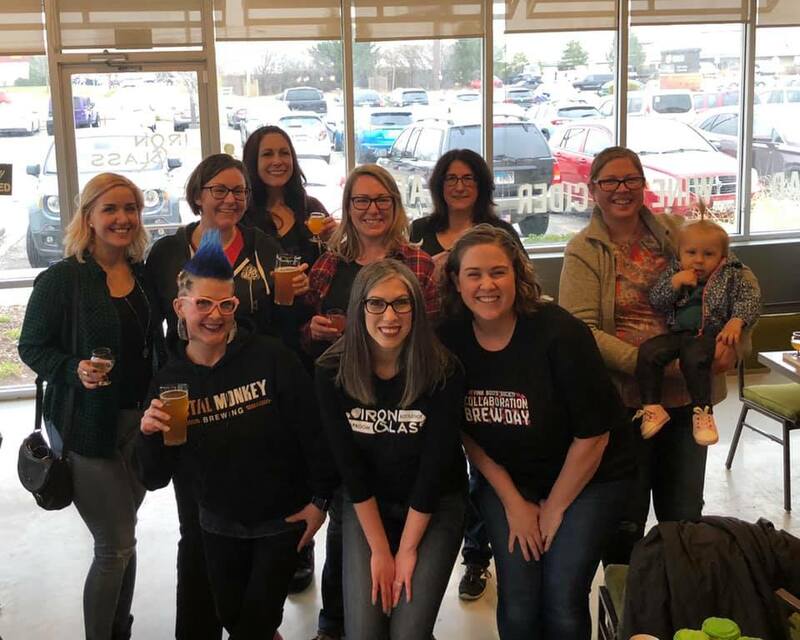 “It is essentially a mashup of a well-known meme (‘hold my beer’) and a popular adage that encourages women to lift each other up,” explained Emily Slayton, co-founder of Skeleton Key and host of the brew day. PBS Hops Blend: 3 parts Sabro, 2 parts Loral, 1 part Glacier, Mosaic, and Simcoe. 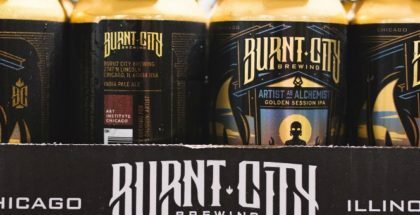 Description: It is a refreshingly dry, citrusy Pale Ale with fruity saison character and pleasantly prominent bitterness (6.7% ABV / 45 IBU). The following comes from a Press Release (again provided by Emily Slayton of Skeleton Key Brewing, who hosted the Pink Boots Society Event). Chicago’s Omega Yeast Labs donated a pitch of its Jovaru​TM​ Lithuanian Farmhouse yeast for the project, a strain that has been nurtured for decades by Aldona Udriene, the “queen of Lithuanian farmhouse beer,” at her brewery in Jovarai. 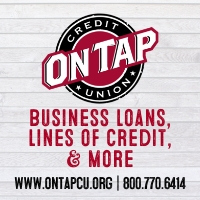 The grain bill, which consists of 2-row, Idaho Pilsner, flaked rye and honey malt, was donated by Country Malt Group, Great Western Malting and Canada Malting. A blend of Loral, Glacier, Sabro, Mosaic and Simcoe hops from Yakima Chief was selected by PBS for the annual collaborative brew day, lending a tropical dankness to the brew. 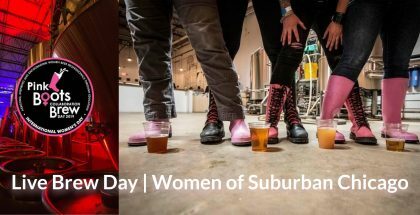 Some of the women involved in the Pink Boots Suburban Chicago Live Brew Day—Hold My Crown Lithuanian Rustic Pale Ale & 10 Variants. Photo Credit: Christen Snodgrass‎, owner of Iron & Glass Bottle Shop. Base: Skeleton Key Brewery Hold My Crown Base Beer. My Reaction: Though most chose to use a form of fruit, notably berries or citrus, the beer’s most striking quality involved its versatility (including working as a wonderful accompaniment to the sausage sandwich prepared by Happy Belly Chefs, by the way). On its own, the base beer offered lovely, striking citrus notes, which is not surprising given the yeast complexities and the addition of Citra and other wonderful hops. In short: The Saison and Pale Ale attributes shined. 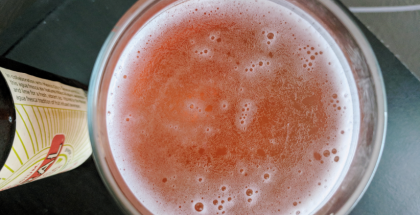 Yet, despite a beer around in flavor on its own, the Rustic Ale acted much like a clear spirit in that it could serve as the base to any number of flavor combos, noted by the range of adjuncts used by participating breweries. From strawberry and passionfruit to rosemary and hibiscus, each beer offered a terrific spin on the base Farmhouse/Saison-style Pale Ale. Thus, like what can be common during Chicago’s season of BBA releases—a base beer released along with adjuncts, the Hold My Crown release provided patrons with two experiences; one could enjoy any beer individually or have fun exploring the flavor combinations side-by-side. Should I declare a winner? No. But, I will tell you my favorite (a subjective decision if there ever was one). I honestly felt that the entire Hold My Crown collection was superbly executed (also, delicious). But, for me, the best combination came from Metal Monkey with its choice to use rosemary and lemon. The earthy, herbaceous nature of the beer worked exceptionally well with the already “rustic” characteristics, seemingly enhancing the base beer. I didn’t pick up on the lemon, per se, but if I may borrow from the side of me that writes about spirits, there was a fresh burst of brightness with the Metal Monkey version that resonated with me. Speaking of spirits. 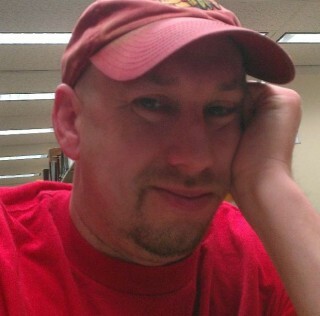 My runner-up would have to be the Elmhurst version comprised of a strawberry adjunct. Refreshing and flavorful, to say the least. One could ask: Is it a beer or a beer cocktail? 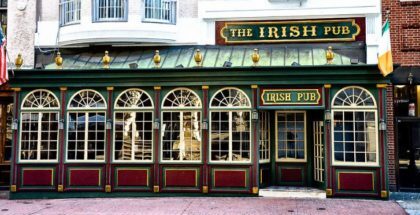 I don’t know but I’ll bet you could serve it at the bars near Chicago’s infamous Rush & Division district for $14 a pop and make a boat load of money. Luckily, both versions, like all the wonderful variants served that night, cost only a few dollars. $1 of each beer served helped fund Pink Boots in its quest to not only shatter beer-glass walls and ceilings, but make us wonder why they ever existed in the first place.